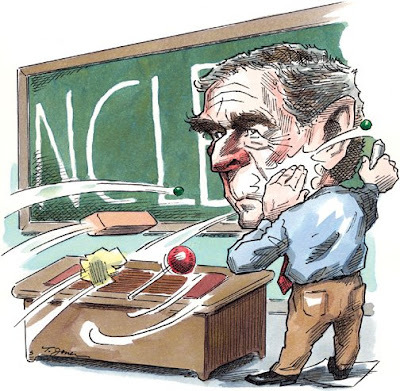 When President Bush signed the No Child Left Behind act it was deemed to have a positive affect on narrowing the educational achievement gap between students. Is the NCLB act truly having a positive affect on closing this gap? I personally, along with many others including President Obama, see the NCLB as ineffective. NCLB forces schools to teach children material in order to raise standardized test scores, rather than teaching basic fundamental principles of education. Then, if test scores are poor, schools as well as students are labeled as “failures.” Another issue with NCLB is inadequate funding of schools which does not allow NCLB to work effectively. I agree with you, Tamara. I work in an elementary school currently and I see how much of an emphasis is put on standardized tests and concentrating on those skills and ideas that are needed from the test, while maybe not always giving a well-rounded and whole education all over. The recent emphasis on standardized testing has really changed the teachers, what they teach, how they teach, and how the students learn. The teachers are having pressure put on them from administrators and it all goes back to the NCLB. I remember being in elementary school and taking standardized tests, but never specifically "training" for them or focusing on them the whole year. It has taken over a lot of the education time, but I don't think teachers have much of a choice when it comes down to it. I agree. there should be no "training", but simply a measure of what is going on in the classroom. Standardized tests are supposed to measure skills being taught over the year, not encourage skills to be taught for passing the test. I feel like the federal gov't is dangling a carrot in front of the school in order to get them to perform. Yes, I definitely agree with you. When I took the standardized tests I was never trained for them either, but merely prepared for them by what we were learning all year. There is absolutely way too much focus on these tests now, and unfortunately it changed and limits the way a teacher runs his or her classroom. AND, not only are we competing for money based on test performance, but we are competing unfairly. By that I mean that in NJ we are held to a higher standard based the level of difficulty of the tests we employ, than say, South Carolina, which if I'm not mistaken, is the worst performing state in the nation. Not only are their curriculum standards lower than ours, but their standardized tests are easier. It's not a level palying field. I agree, I don't remember training for standardized tests in elementary school either. There was never an emphasis on having to pass those tests, in fact I don't ever remember my elementary teachers making a big deal about them, because it was simply measuring what was being taught all year. With the NCLB, teachers have to spend class periods preparing students for these tests and end up teaching to the test. This only hurts the students, are they being taught the curriculum requiremtnts for that grade level, or are they just learning how to pass the test. I agree also that teachers probably don't have much of a choice because it seems that they are being judged on how well their class performs. They don't want to risk their job so they end up teaching to the test, I don't think anyone is helped by NCLB. It seems we are teaching children how to pass a test instead of focusing on what they should be learning at each grade level. I completely agree with all of the comments mentioned. Growing up within the catholic school system, I was never "trained" to take standardized tests. The tests we were given were simply used as a measuring tool to see who was learning and who was having difficulties learning the material. If people did poorly on the test, it was a sign that a different approach would have to be used. Nowadays, I feel that there is too much emphasis on standardized testing. Instead of teaching students for their understanding and grasping of the information, students are being taught to memorize information so they can outperform other schools within the testing scores. I personally have never had a good experience with standardized testing, such as the SAT's and GRE's. I feel that these standardized tests, as well as others, do not offer any indication as to how students are thinking critically, solving problems, or learning the information. These test scores are simply creating pressure on students and faculty to perform well instead of have any personal academic achievement. Instead of labeling students as 'failures' based on their scores, we as professionals, should be helping students undersatnd and grasp the necessary information so they too can be able to succeed within their education. Let me say, that I do think NCLB has a lot of problems. However, I think there are a lot of good things about it, and it could have potential. From reading the law, it seems to me, that the States are able to develop their own standards, goals, plans, pick their own tests, etc. So really, it's not NCLB we have a problem with, it's NJ. Also, local agencies can choose, as can the states, whether they want to participate. I think it would be interesting, if rather than JUMPING on the money, NJ worked together, with a team of representatives from a variety of districts to develop statewide curriculum, statewide materials, statewide valid standardized tests, etc. I don't see anything there that prevents that. In fact, empirically based measures are encouraged, as is response to intervention, as an option to the discrepancy model in the law. I think that the literacy rates in our country (check out this article http://nces.ed.gov/pubs93/93275.pdf) indicate that something needs to change.